In my travels and conversations I encounter growing numbers of Christians going through what is often called “deconstruction.” These are believers in the process of paring away the extraneous elements of culture, myth, and toxic dogma from their faith. I’m sympathetic with this undertaking. This is necessary work for many (though not all) who seek to retain Christian faith in an increasingly post-Christian culture. But while I’m sympathetic with the need to rethink Christian faith, I don’t like the language of deconstruction. Deconstruction is too negative, too violent, too cynical. It has a tendency to lead to the irreverence of iconoclasm. This is the young Christian who having escaped the suffocating world of narrow fundamentalism, now just wants to burn everything down. This reaction, though understandable, is ultimately neither wise nor helpful. For the Christian, deconstruction is not an end in itself; deconstruction alone is not a proper goal. We can’t deconstruct forever. If all we ever do is deconstruct faith, eventually there will be nothing left — just the discarded rubble from the relentless blows of a sledgehammer. The goal of reevaluating Christianity is authentic faith, not cynical unbelief. Let me propose a better way of talking about the process of rethinking Christian faith — a healthier metaphor. Instead of the negative metaphor of deconstruction (and deconstruction is a metaphor), I prefer the positive metaphor of art restoration. Think of an ancient icon of Christ. Imagine, for example, that a thousand year old Christ Pantokrator painted on a wooden panel is discovered in some forgotten monastery. The image of Christ is there, but it is covered with a thick patina of grime, dirt, and soot accumulated over centuries that has obscured the image of Christ. 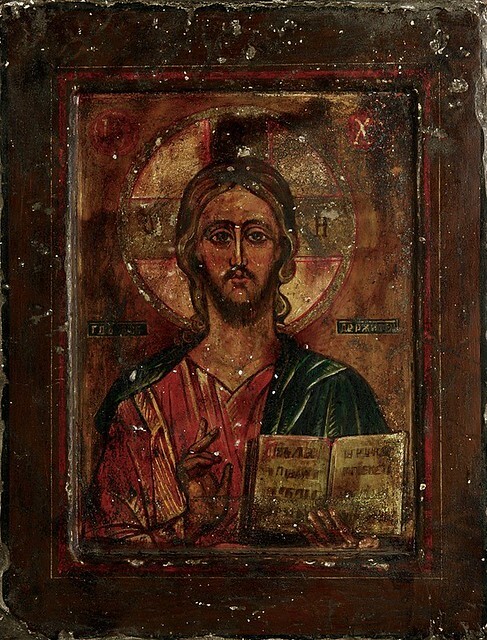 Now imagine that a restoration artist is given the task of returning the icon to its original vibrancy and beauty. Think about how the restoration artist goes about her work. Among her tools for restoration work we will not find explosives. You can’t restore art with dynamite! It’s true that faith in Jesus Christ has been distorted over the centuries by layers of varnish, lacquer, dirt, and grime. The beautiful image of Christ has been obscured by the imposition of cultural assumptions, political agendas, distorted doctrines, and the corrupting influence of empire. Fundamentalism, literalism, nationalism, and consumerism have created layers of varnish that distort the beautiful image of Christ. But as we seek to remove these contaminants and recover the beauty of Christ, we cannot employ cynical and violent methodologies. If we do, we run the risk of destroying the priceless treasure in the process. We must be patient and reverent. If all we want to do is deconstruct and destroy Christian faith, we can swing an angry hammer; but if want to restore Christian faith, the patience and gentleness of wisdom is required. In our passion to rescue Christian faith from its myriad of distortions, we are not like the Taliban blowing up the Buddhas of Bamiyan, but like the artists who restored Michelangelo’s vandalized Pietá. In rethinking Christianity we must always keep in mind that we are handling something enormously precious — faith in Christ. It’s precisely because faith in Christ is so precious that we are committed to the difficult task of restoring it to its original beauty. But we cannot use cheap cynicism and crude mockery in this delicate task. We go about it patiently, reverently, gently, always showing deep respect for the Great Tradition that has sustained Christian faith and practice for two thousand years. This is why I always insist that I am deeply conservative. When it comes to Christianity I am far more conservative than progressive or liberal. My way of sustaining Christianity in an age of secularism is to root it in the rich soil of the Great Tradition. An emphasis on sacrament and liturgy, creed and calendar, and a church untethered from Constantinianism is a truly conservative position. Modern fundamentalism is not conservative, it’s just a reactive form of liberal empiricism. Fundamentalism is another guise of deconstruction. Fundamentalism is to Christianity what paint-by-numbers is to art. We don’t need to deconstruct Christian faith, we need to restore Christian faith. We do it prayerfully. We do it patiently. We do it reverently. We do it with kid gloves and Q-tips, not with dynamite and sledgehammers. We do it with our wisest saints and sages, not with Nietzsche and Derrida. My journey of rediscovering the beauty of Christ was mostly a journey I traveled in prayer. It’s true that I read a ton of good theology, but this only changed my mind. My heart was changed as I learned to sit with Jesus in contemplative prayer. Don’t deconstruct…pray. Sit with Jesus. Gaze upon his beauty. See the beautiful image of Christ lying under the patina of distortion. Keep your eyes on Jesus. Then wipe away the false varnish with your tears of gratitude. This is restoration, not deconstruction. This is what will save your faith.